Dion is an Imperial guard and captain of the town guard in Skingrad. He sleeps from midnight to 6am in his room on the top floor of Skingrad's guard house, mistakenly (see Bugs) patrols the Guard House from 4pm to 6pm and eats dinner there between 7pm and 9pm. The rest of the time is spent inspecting his charges in the town guard. When not sleeping, eating or patrolling the guard house, there is a 66% chance of him standing outside the Great Chapel of Julianos. If he's not doing that, then he will patrol on top of the bridge by the east gate to town or spend time in the Guard House. The exception to this schedule is when you begin the Paranoia quest, when Dion will actively seek you out to warn you about Glarthir. 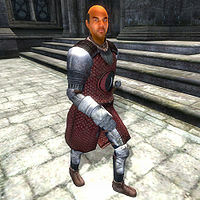 Dion wears a standard guard uniform consisting of a Skingrad Cuirass with steel gauntlets and greaves that he wears with thick cowhide shoes. He also possesses a middle-class outfit of tan linens and brown shirt, both of which he'll be wearing while he sleeps. He wields a steel longsword and holds a key to the guard house and a few gold coins. When asked about Skingrad, he will give you a few recommendations: "Try our wines and cheeses, and Salmo's sweetrolls. See the castle... but don't expect to see the Count. He doesn't mix with strangers." Although Dion is in charge of the town's security, his colleague Danus Artellian makes it clear that his authority doesn't extend to the castle. Around town, Dion seems to be regarded fairly well for a guard, with Skingrad's citizenry only saying "I hope nobody tries to get away with anything when Captain Dion is around. He's a tough customer." and "Dion takes his job as Guard Captain very seriously. He's all business when he’s working." If you tell Dion you're working for Glarthir: "Let me give you some advice. Glarthir is crazy. So far harmless crazy, but I keep an eye on him because it's my job to. You don't want to get involved with him. I don't care how much he's paying you, it isn't worth it. Like I said, he's crazy. Since you were courteous enough to tell me the truth, I'll do the same by trusting you to talk to a guard if he asks you to do anything... strange." If you tell him you're just curious: "Fine. Play it that way. Let me give you some friendly advice. Glarthir is crazy. Maybe harmless crazy, maybe not. Don't get involved with him. If he asks you to do anything... strange... you come see me first, got it? Or any of the town Guard. Let us handle it." If you tell him it's none of his business: "It is my business. Allow me to introduce myself: Captain Dion of the Count's Guard, at your service. Now, you were telling me why you're interested in Glarthir." The name "Dion" seems to have been a late change in the game and he may even have been female at the start. All his AI packages and his script refer to him as "Dionne". There are also two bits of dialogue assigned to Mog gra-Mogakh: "Well. The guards must've been careless. But Captain Dione has the guard on full alert. We'll be safe." and, significantly, "Certainly so. Captain Dione knows her business. And no enemy has ever made it over Skingrad's walls.". Dion should sleep in his clothes rather than his armor but the "Armor Unequipped" flag is not set on his sleep AI package, which can cause him to sleep in his armor. It seems likely that Dion was meant to inspect the three locations roughly equally, but the AI package uses ">" (greater than) instead of "<" (less than) in its comparisons, giving the wrong percentages. Due to yet another bug in the AI packages, Dion will not explore Skingrad at 4pm like he's supposed to, but will explore the Guard House instead. The exploration packages are set up as "Find" ones, which means Dion will occasionally crouch down - apparently for no reason - and then begin a different routine.